Bonnet on and Possum looks just like any other GDI Plus 4 with no clue as to what's under the bonnet. Another 40 miles or so today on dry (but slightly salty) Cornish roads. The engine is feeling very smooth. Note the temporary boost gauge velcroed to the dash top. 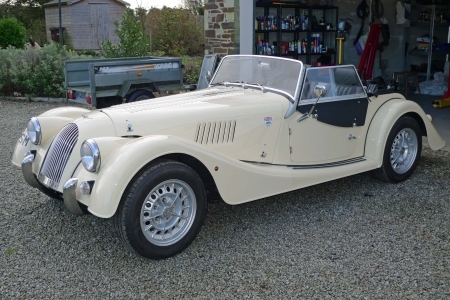 Possum, the first Morgan Plus 4T! A good article in Miscellany, I look forward to "part 2". Your comments about all that said "it can't be done" made me smile. I love boost guages , we could all do with them !